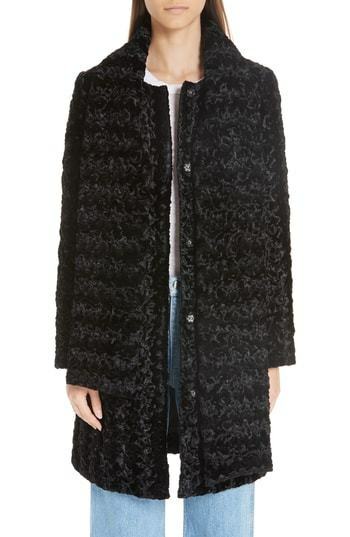 Dress in a Paskal faux fur coat with scarf and a black silk evening dress to look truly gorgeous. Beige leather pumps will add a new dimension to an otherwise classic ensemble. If you're after a casual yet absolutely chic ensemble, try teaming a Paskal faux fur coat with scarf with black leather leggings. Both pieces are totally comfy and will look fabulous paired together. Black leather ankle boots will instantly elevate even the laziest of looks. Wear a Paskal faux fur coat with scarf for a stylish and sophisticated look. For a smart casual look, consider wearing a black fur coat and light blue jeans — these two pieces play perfectly well together. When it comes to footwear, this getup is complemented nicely with black cutout suede ankle boots. If you're on the hunt for a casual yet chic getup, consider pairing a Paskal faux fur coat with scarf with black leggings. Both garments are totally comfy and will look fabulous paired together. For something more on the daring side to round off this getup, throw in a pair of black athletic shoes. For a casual chic outfit, wear a Paskal faux fur coat with scarf with a silver bodycon dress — these items play really well together. When it comes to footwear, this look is complemented perfectly with silver leather heeled sandals. If you're on the lookout for a casual yet absolutely chic look, rock a Paskal faux fur coat with scarf with a red satin maxi dress. Both pieces are totally comfy and will look fabulous paired together. When it comes to shoes, this ensemble is complemented perfectly with black leather pumps. For a neat-meets-totally stylish look, choose a Paskal faux fur coat with scarf from Nordstrom and black leather skinny pants — these two items a work setting really great together. Black suede pumps work wonderfully well here. If you're on the hunt for a casual yet totally chic outfit, consider pairing a black fur coat with light blue ripped boyfriend jeans. Both items are totally comfy and will look fabulous paired together. You could perhaps get a little creative when it comes to footwear and lift up your getup with white and black cutout suede ankle boots.